Cut the broccoli crowns into bite-size florets. Peel the broccoli stems and cut them into bite-size pieces. Transfer to a salad bowl and add the carrots, raisins, green onions, and cranberries. Toss gently. Combine the vinegar, mayonnaise, sugar, and pepper in a small bowl. Pour over the broccoli mixture and toss until evenly distributed. Let stand for about 30 minutes before serving to allow the flavors to blend. 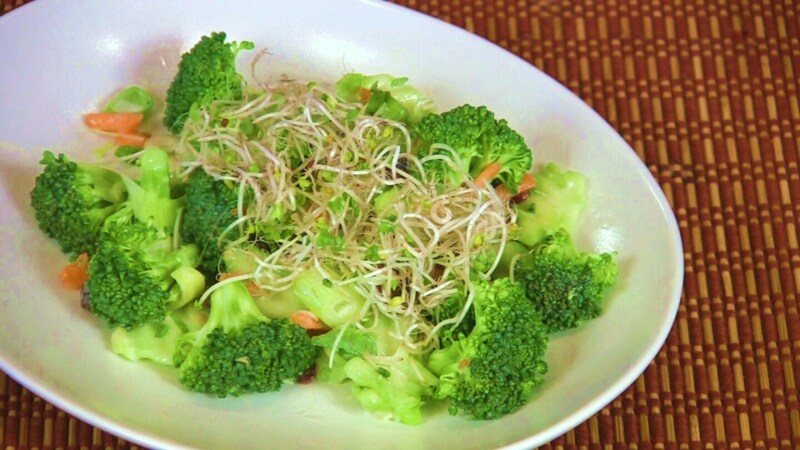 Top each serving with one-quarter of the broccoli sprouts if desired. Stored in a covered container in the refrigerator, leftover Broccoli Salad will keep for up to 3 days. *Or, make your own mayonnaise. Watch How to Make Tofu Mayo. Katherine's Tips: 1) Double the amount of dressing. 2) For more tender broccoli, par-boil it before adding to the salad.